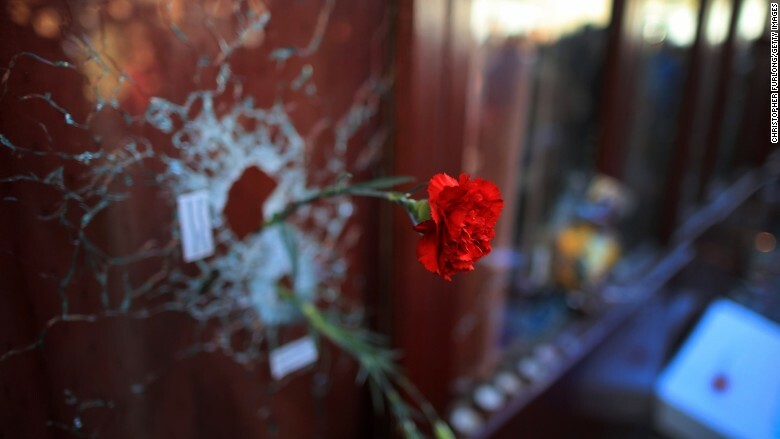 A flower is placed inside a bullet hole in the window of Le Carillon restaurant following terrorist attacks across Paris. French restaurateurs and cafe owners are banding together to get diners back in their doors following Friday's terrorist attacks in Paris. The term #TousAuBistrot -- which roughly translates to "back to the bistro" -- is trending on Twitter (TWTR). Restaurant guide Le Fooding is credited with coining the term in an online post calling for people to return to restaurants, brasseries and cafes on Tuesday. The publication said it wants diners "to commemorate the victims of the attacks" and "to support all those working in the restaurant and entertainment industry [who were] targeted by these deadly attacks." It said some restaurants would observe a moment of silence at 9 p.m. local time (3 p.m. ET). The coordinated attacks targeted a bar and restaurants in the heart of the city at a time when people were just starting their weekends. At least 129 people were killed. Online posts using the hashtag #TousAuBistrot have begun popping up on Twitter showing people eating and drinking at restaurants. Another term -- #JeSuisEnTerrace, which literally translates to "I am on the terrace" -- is also being used to encourage people to return to the city's trademark cafes and bars. France has been observing a period of national mourning since Sunday. Life in Paris has slowly been returning to normal after the attacks but a state of emergency remains in place, giving the authorities the power to limit people's movements. French President Francois Hollande is asking parliament to extend the state of emergency for three months.